DOCTOR WHO Dalek Week - DAY OF THE DALEKS | Warped Factor - Words in the Key of Geek. Matthew Kressel looks back at the Third Doctor adventure, Day Of The Daleks. Five years after their apparent “final end” in the Second Doctor story The Evil Of The Daleks, and one aborted spin-off attempt later, the Daleks finally returned to Doctor Who. Broadcast across January 1972, Day Of The Daleks launched Doctor Who's ninth season with a bang. Yet, in the decades since it was first broadcast, the story's reputation has diminished somewhat. Part of the reason for that might be because of the Daleks themselves, or rather how they are presented in the story. The story was originally commissioned from writer Louis Marks without them in it, with the intention being that they would feature in another story all together later in the season that was given the provisional title Daleks In London. Perhaps sensing that the season's opening story would be aided by their return, the plans for Daleks In London were dropped and Marks reworked his story to bring them into it. That fact is something that is quite apparent upon viewing Day Of The Daleks. For much of its four episodes, the story has the Daleks doing little else but sit in a room issuing orders to their minion the Controller and thru him to the Ogrons. 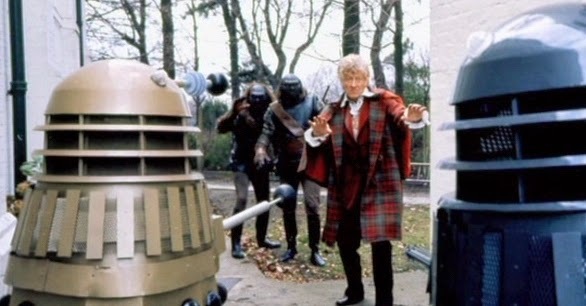 It would appear that the original storyline had another alien invader controlling them and that the Daleks were simply substituted in their place. When they finally move in episode four the results are less then spectacular. The battle between UNIT troops and the Daleks/Ogrons has long been criticized by everyone from fans to the late Jon Pertwee himself. Director Paul Bernard seems not to have had a flair for directing action sequences, and the fact that he opts for a number of long shots that quite blatantly reveal that there are only three Daleks and a few Ogrons rather than the larger force that should be there, is something that rather undermines the story significantly. Exacerbating the problems the Daleks have in this story is the unimpressive voice work. The Dalek voices of Oliver Gilbert and Peter Messaline are by far the worst of the entire original series run. The voices the pair do aren't so much 'Dalek' as a very poor imitation of them that makes them sounds more like the cliched monotone robots of yesteryear than the threatening, malevolent force we've come to expect from the Daleks. With all the problems added up, it seems clear that this story wasn't the Daleks finest hour and it's hurt by that fact significantly. Many of these problems though are cosmetic and the story's DVD release in 2011 saw an attempt to rectify them in the form of a special edition version released alongside the original broadcast version. This new version saw a new set of Dalek voices being provided by Nicholas Briggs who, with more than a decade of providing Dalek voices between Big Finish and the new series, has turned into one of the finest voice artists to ever voice the Daleks. The addition of his voice to this special edition once again shows why this is the case across all four episodes but especially in the cliffhangers, such as the added “Exterminate!” in the cliffhanger for episode two which gives the Daleks a whole new sense of menace missing from the original version. The overall result being that the Daleks have a much stronger presence in the story thanks solely to improved voices. Perhaps the most obvious improvement in the special edition version though might come in that oft-ridiculed final battle sequence. With its combination of new Dalek voices, a couple of newly filmed sequences and just a small amount of CGI work, the sequence is greatly improved. The new Dalek voices give them a stronger sense of authority and menace as they issue orders at the beginning of the sequence. The new effects create a flurry of activity in the form of bullet impacts and various ray gun blasts flying about. The newly filmed footage is expertly lined up in places to match in with the original shots to add more Daleks and Ogrons to the siege showing the much larger force hinted at the sequences start. The newly filmed footage also adds some additional material to the sequence as well which, thanks to the same grading that matched the footage into the story previously, is brilliantly intertwined into the sequence. The overall effect is a much more frantic and believable battle that gives the sequence what it had lacked in its original version. What the special edition's cosmetic fixes helps to do is to draw the viewers attention to the more positive aspects of the story that have often been overlooked, especially in its script. Louis Marks deals with the issues of time travel paradoxes intelligently, years in advance of other science fiction shoes and blends them well into a story about the world on the brink of World War III. When the action moves to the 22nd Century is becomes a familiar tale of a handful of people fighting to free themselves from oppression. While this has some echoes of The Dalek Invasion Of Earth in it and lacks the depth of that story, it still makes for some intriguing viewing. The script does have two problems: the lack of a role for the Daleks (discussed above) and the fact that the ending leaves a few interesting strands of the plot loose (though that might be because a scene meant to have been recorded wasn't, thus leaving the abrupt conclusion we have today). Those flaws aside Day Of The Daleks has one of the finest scripts of the Pertwee era. In the final analysis then, Day Of The Daleks is perhaps a story that is ultimately more than the sum of its parts. With the special edition version available, it is easier to see past the more cosmetic flaws the story has, to see both more positive aspects of it and flaws that no special edition version could fix. Despite its flaws though, and perhaps because of Marks' script dealing with time travel paradox's, the story remains the best Dalek story of the Pertwee era.